HUGE Elementary Library Product BUNDLE! Important: This product is also part of a huge discounted elementary library product bundle you can purchase here: Huge Elementary Library Product Bundle! BUNDLE AND SAVE $! 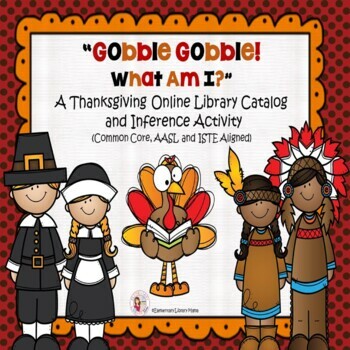 This bundle contains three online library catalog/inference activities suited for Halloween, Thanksgiving and Christmas. Included are two pages that you can copy back to back. There are 10 Thanksgiving riddles/clues. Students must use their inference skills to determine what the answer is. After they write the answer down, they use the online library catalog to perform a keyword or title search. They then write down the title and call number of a book they found. You may have the students work alone, in pairs or in groups depending on their ability. My students really enjoy completing this activity! Although I am an elementary media specialist and use this for my upper elementary students, I think this would be fun for middle school students as well! I’ve also included an answer key for you to use. Be sure to check out the other products in my store! Please let me know if you have any questions. Thanks for looking and HAPPY THANKSGIVING! This product is to be used by the PURCHASER only! If others in your district would like to use this, please follow copyright rules and purchase additional licenses which are offered at a discount. Still have questions or a special request? Subscribe to my Blog for exclusive freebies just for my readers!